The residency is nominally 8 weeks duration, but split into blocks will likely last 8 months end to end. I wanted to start during the tourist season, to see how the Estate operates when it is full of visitors. This brief spell was cut in half by attending the Imagine Natural Scotland Conference. Since then 5 weeks have passed, home life and other projects have taken my thoughts further from the residency than I had anticipated and made packing for the return really tricky. The intention is to ‘be there’ for a whole month now – proper immersion – time to develop ideas and start making. But the timing seems out of kilter, autumn should be the season for hunkering down, lighting the hearth and staying home. 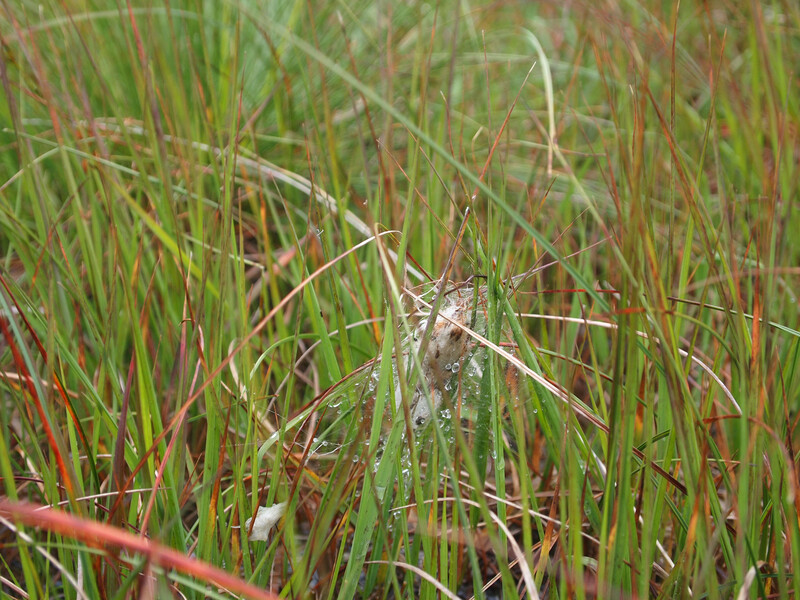 A last trawl through photos from the summer visit unveiled this spider’s ‘home in the highlands’, what must it feel like to call a few bent dew-bedecked blades a ‘roof’? I would have missed it completely without the perceptive ranger I had for company that last rainy day. This entry was posted in Uncategorized and tagged Arran, Arran Ranger Service, Autumn, Brodick, Highlands, Imagining Natural Scotland, Journey, Residency, Summer, Tourism. Bookmark the permalink.